Planning a children’s party or event? Planning amusing and fun activities that cater to all your guests can be difficult and not to mention stressful. As adults, we need to enjoy planning as much as the kids enjoy partying. Before you get started, it is important to consider including your kids in every step of the planning process and allow them to provide input on food, crafts and entertainment. Let out your inner child, and follow these steps to ensure that your next kid’s party becomes an outstanding hit, and more importantly a joyful memory. Whether the children are animal lovers, outgoing adventurists or Disney enthusiasts, deciding on a theme can create a genuine, life-like experience. Bouncy castles are a wonderful way to incorporate a themed atmosphere in a party. Activities like obstacle courses and outdoor games should complement each other with subject and style. This will immerse young children in a themed playground, filled with imagination. Taking the time to individually select bouncy castles and party rentals can make an enormous difference. Having commitment, energy and most importantly, the right party rentals will make every event a success. Establishing a planned agenda for the duration of the party can reduce boredom, and ensure the involvement and cooperation of the entire crowd. It can be as simple as greeting the guests, giving the children free play time in the bouncy castles, enjoying an organized activity and ending it off with a gourmet, savory BBQ cooked with smoked meat. Simple in theory and very commonly overlooked, entertainment is a vital component to any children’s party. It is often enough for children to find joy in just spending time with their friends and family; however, in a group setting the dynamics change dramatically. Adult organized games and group activities become key in creating a pleasant and lively party atmosphere. Party rentals like bouncy castles or giant checkers require minimal adult supervision while ensuring the entire party’s participation. 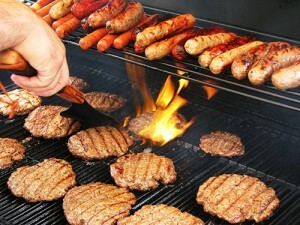 Offer a range of foods, including fresh fruits and vegetables and be aware of any allergies the guests might bear. Smokers and BBQ’s are perfect for any outdoor setting and are guaranteed to tease the children with mouth watering smells before the feast. Enjoying an enticing, gourmet dish can bring a flavorful conclusion to the party, and make everybody eager to be invited once again. 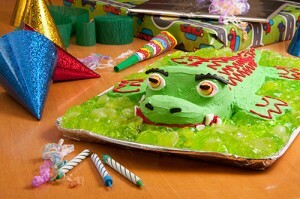 When planned appropriately, hosting a kid’s birthday party can be a blast! Take the time and consider your child’s age before deciding on the venue and type of entertainment that will put a smile on your child’s face. It’s highly likely that the organized games planned for your six year old, won’t entertain a three year old. Taking into account a child’s age is one of the most essential, yet overlooked factors when planning for a successful and enjoyable party. By planning according to a child’s age, you can ensure that the party will be remembered as a success by all the guests and especially by the child being celebrated. At this age children should not be overwhelmed with numerous guests and they are too young for organized games. Inviting just family and a few very close friends should be enough to keep the child laughing, allowing him or her to focus on the most important part of the party, the “happy birthday to you” cake and candles. Children now tend to interact well with each other and start to enjoy playing without the involvement of their parents. Becoming overexcited is common, so adult supervision is a must, and planning games carefully can ensure that the party does not end in tears. Keep the number of children fairly small and focus on simple games, especially ones involving music. 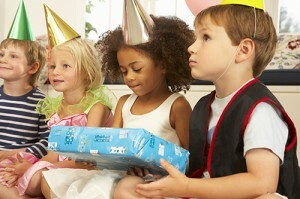 Children begin to understand the importance of birthdays and can enjoy planning the birthday as much as the party itself. They become more active and find more joy in themed parties. Use appropriate colors, decorations and flowers to add realism to your theme. Bouncy castles and obstacle courses can complement the theme of choice, all while adding physical activity and group interaction to the birthday. At this point it becomes increasingly important for children to be around friends rather than adults. Rules of games are much more easily understood and children become highly co-operative for organized games. Bouncy castles are always a great choice however; card and board games such as chess and checkers can also be very enjoyable. Even something as simple as a night of children’s card games can turn out to be a huge success. By this age, tastes start to differ and planning appropriately can present a bit of a challenge. Ask friends and family to help prepare for the event and definitely include the birthday boy/girl in planning. Themes are always a good way to start as long as it will appeal to the majority of the invitees. Consider renting a venue, such as a multipurpose church room or even plan for an outdoor party, which will make it easier to include Bouncy castles, BBQs and of course, outdoor activities.Most importantly, work with your teen and review the details and expectations regarding the number of guests, ending time, and no-tolerance policy for alcohol and drugs. It goes without saying that your budget will dictate whether you plan for a party at home, at a venue or if you will hire an entertainer to keep your guests amused.Party rentals are a great way to make the most of your budget and to reduce the stress associated with finding the right equipment, decorations and games. 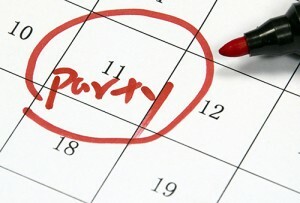 Make sure everything is planned and ready before the big day so you can reduce stress and rushing around last minute. Above all else, remember to relax and enjoy the special day, you deserve it!